October 13, 2014--For Grace has been framed and is hanging in my friend's kitchen. The frame and matting are perfect. June 30, 2014--Have completed this project and delivered it to my friend and neighbor. She loves it and it looks wonderful with her wall color and decor. I'm so glad. June 25, 2014--Wasn't happy with the Frosty Rays color I chose to use in Block 3--it took on a greenish tone in bright light and since this is to be a gift, it has to be perfect (which means--no green). So did some frogging last night and replaced the Frosty Rays with Impressions. Am much happier since it is balanced by the Impressions used in Block 1. Now on to the border flowers and leaves to finish. June 8, 2014--The fourth quadrant called Wild Rose Block is finished and am now ready to work on the borders. Will be done soon. This has been an absolute pleasure to stitch. April 18, 2014--The third quadrant called Lily Block is done. Need to work on other things for now, so probably won't finish this in April as hoped. It'll call to me in June. April 6, 2014--The second quadrant called Dogwood Block is done. I'm going to try to finish this piece this month. April 2, 2014--Finished the first quadrant called the Tulip Block. It's so pretty and Pam Gardner's instructions are very clear. Each block has a list of threads used and since I wasn't using Pam's color choices and alternates, I nearly missed the far right column which lists the number of strands to be used for each color and the length to cut. So glad I caught that and it's very helpful to know how much thread to use for each section. Thanks Pam for adding this to the Thread Usage List. 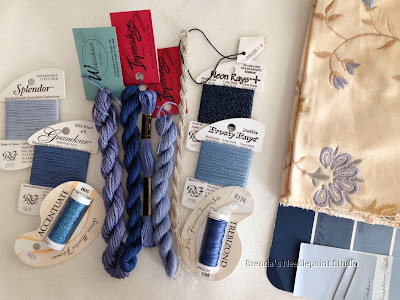 February 24, 2014--While in Pennsylvania last weekend visiting Longwood Gardens, I took the opportunity to shop at Fireside Stitchery in Frazer to purchase the threads needed for this project. With the help of Tony, we pulled the threads recommended for the blue-purple colorway, then he left me on my own to choose colors to match my friend's paint and fabric samples. Had a wonderful time and the best part is that the shop had all the thread brands I wanted. In fact, there isn't much they don't have. The picture below shows the colors chosen and how well they match the paint and fabric samples. December 13, 2013--Have enrolled in ANG's Cyberworkshop by Pam Gardner called "For Grace". The online class runs from March 1, 2014 through July 1, 2014. When completed, this will be given as a gift to my dear friend and neighbor for her to hang in her kitchen, but she will need to frame it herself. She is aware of this project and I have her fabric and paint samples to use for thread matching. I can't wait to begin. Please click on the above tab called In Process Projects to see a picture of the designer's finished piece.